A deep bow of gratitude for showing The Studio your love this weekend - we had a nice turnout for #SmallBizSat! Several who weren't in town this weekend have requested an extension and we are happy to announce, we'll be extending our Holiday Sale through Wednesday @ midnight. The Studio will be open Monday from Noon-5pm for any in-studio shopping. Class Passes, Gift Certificates and our Holiday Packages are also available online through Wednesday. 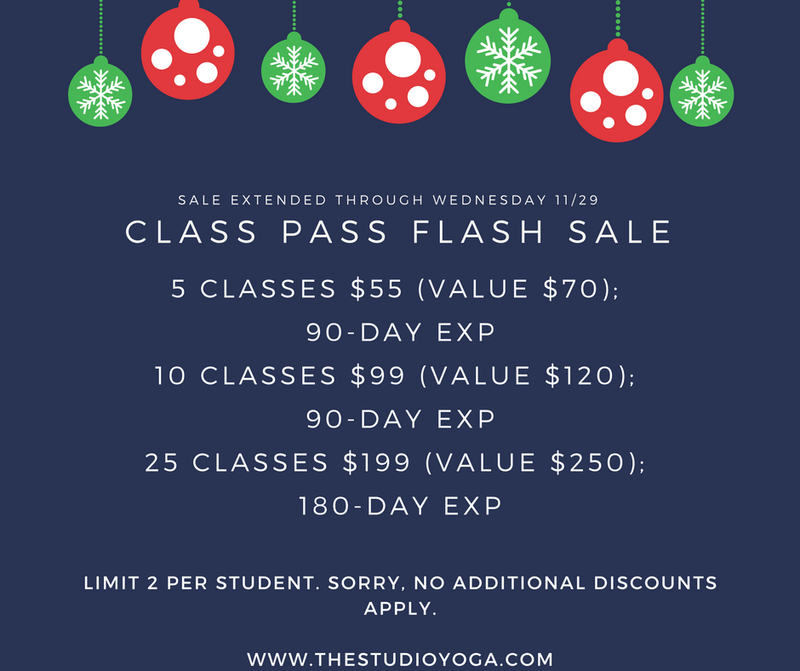 Keep that yogi-glow through the holiday season and ride that joy right into the New Year with our Holiday Flash Sale - discounted pricing on our Five, Ten and Twenty-five class passes. Want to share your love of yoga? We are running a great deal on $50, $100 and $250 gift certificates - give a gift, get a gift. 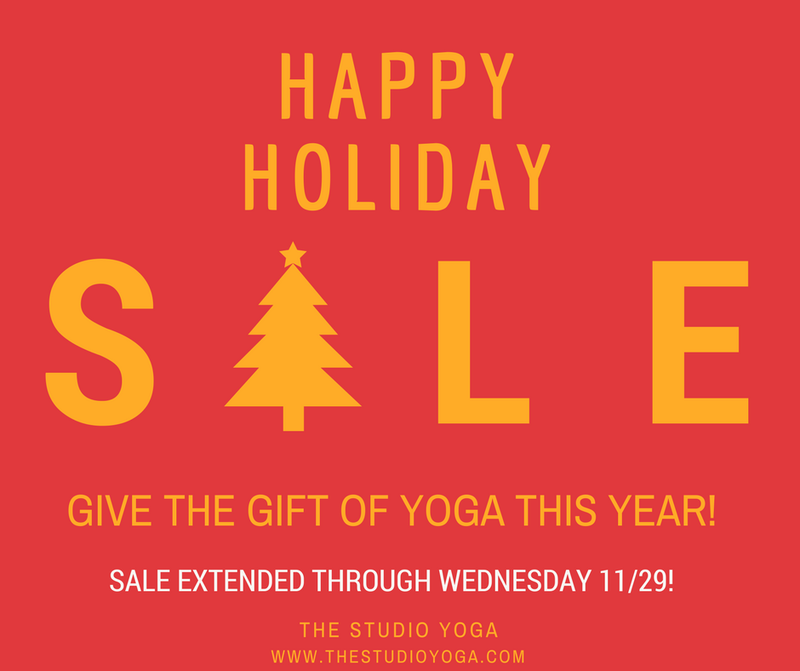 We've made it super easy to please the yogi in your life with gift packages this year - take a look! 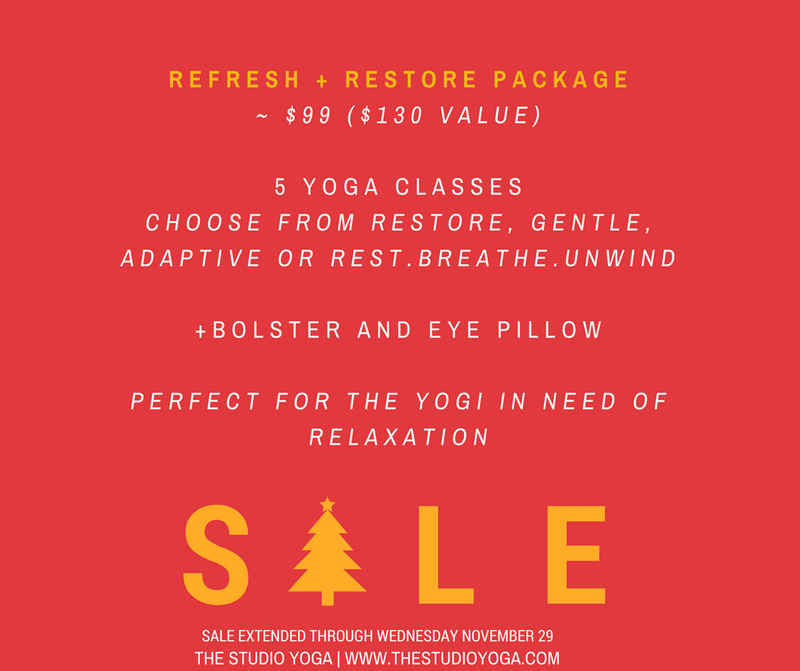 Join in on any 5 Restore, Gentle, Adaptive or Rest, Breathe, Unwind classes. Includes your very own Bolster and Eye Pillow to use at home or in class. Normal Retail $130... Just $99 if you purchase before Wednesday. The Fundamentals Holiday Package comes with your very own Cork Block, Strap, and Mat Spray. OH! And it also includes any 5 FUNDAMENTALS 1 or 2 Classes on our schedule! This is a GREAT gift for anyone who's been talking about practicing yoga, but doesn't know where to begin. "Well that's all well and good, but what about if YOU want to get yourself something..?" If you're more active, or an early riser, this one is for you. 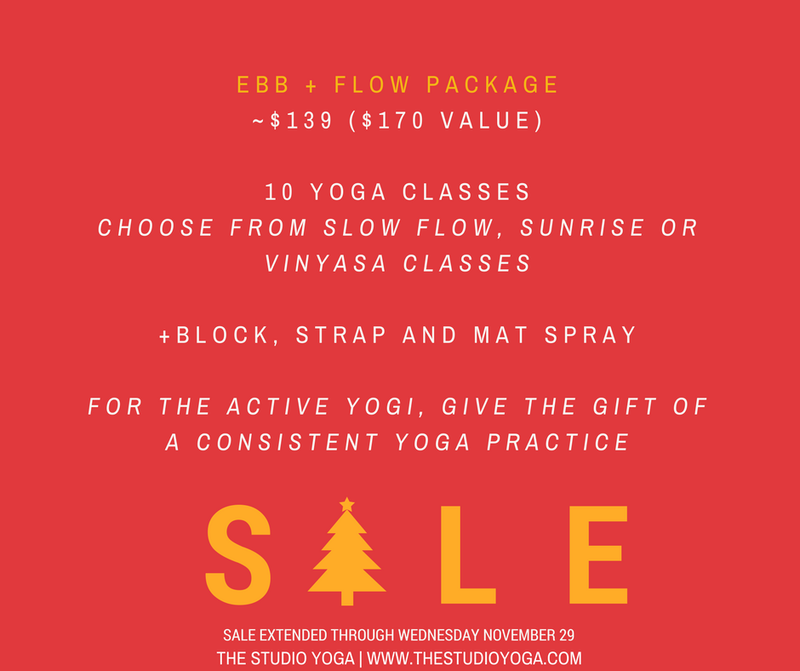 Choose any 10 Slow Flow, Sunrise, or Vinyasa Classes on our schedule, and we'll include your very own 4" cork block, strap, and mat spray. Normally $170 with all this stuff, it's only $139 if you purchase before Wednesday. Need props to support your home practice? 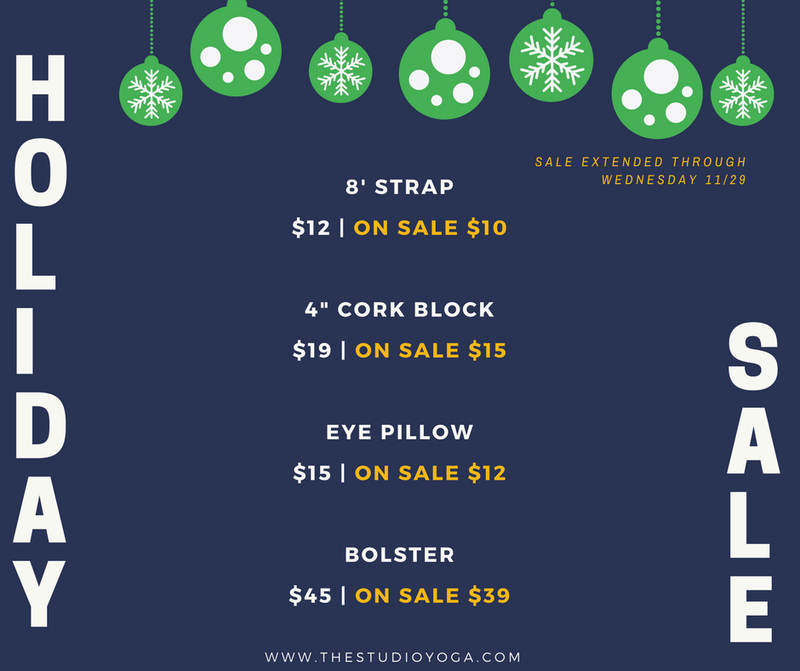 We'll be carrying a few essentials at The Studio Yoga through the holiday season - blocks, straps, bolsters and eye pillows make it easy to get your practice in at home when you can't make it to The Studio. The deals are aplenty! 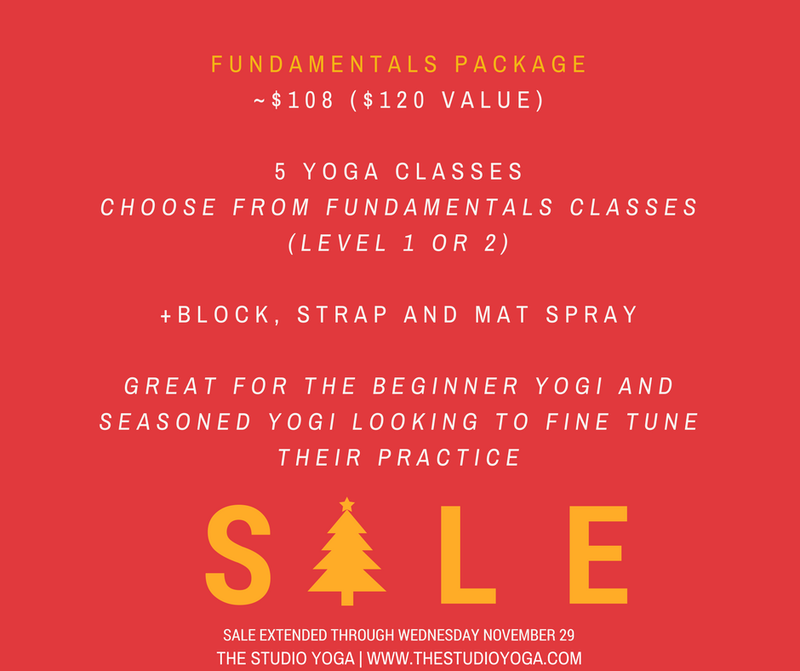 Share this with a loved one and help them, help you get the yoga you need at really great prices. Don't delay! Our Flash Sale will run from Black Friday, November 24 through WEDNESDAY, November 29 at midnight. Sorry, No additional discounts will be applied.